i was gonna write up a little something about how hollywood should stop whining about low theater attendance and realize that the real reason that people aren't going to the movies is that other people are there. talking, testing, yelling at the screen. shut up. but i try not to post anything too negative here on the blog. two drums and a cymbal fall off a cliff. 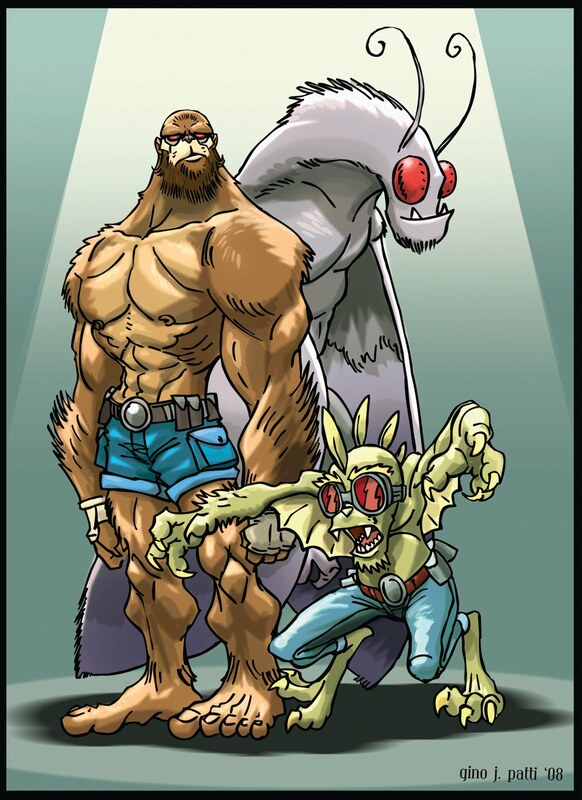 while rifling through the perhapanauts files for some reference the other day, i happened upon a folder called "perhapa-pin-ups" which features a lot of wonderful artwork by various artists from right here in our perhapa-family! most of them have only ever been posted once and i thought it would be fun to re-visit some of these awesome pieces! here's one of my favorites from our pal gino patti! i love it when one artist sings about another artist in their songs. 1. in the song sweet home alabama, what singer/songwriter does lynard skynard call out about talkin' trash about the south? 2. who was singing on the radio in bruce sprinsteen's thunder road? 3. in the song true by spandau ballet, who were they listening to "all night long"...? 4. along with the beatles and the stones, mott the hoople sang about what 60s/70s glam band in all the young dudes? 5. in eddie money's take me home tonight, he sings "just like ronnie says..." ("sang") who's ronnie? That's a great pinup! I love his take on Karl. Neat. 1. Neil Young. That's all I got. The new Sherlock is awesome. I cannot wait for more episodes almost as much as I cannot wait for your news on Monday. 2. In "Thunder Road" it's Roy Orbison singing about the lonely. Hey thanks for posting that!